LaTerrion Green (51) is expecting have an All-State type of year and with his physical ability, he can absolutely do that. There aren’t many defensive linemen that are big at 300 lbs and are quick but Winnfield DT LaTerrion Green is one of those players. LaTerrion Green can be one of the most improved players this season. Last year, Green broke out and was named Second Team All-State. Don’t be surprised if Green makes the First Team All-State list this year. He does a great job of holding his ground and shutting down holes for runningbacks to run through. He can also penetrate and create havoc at the nose guard position as well. Also, have I forgot to mention that he also can bench press almost 500 lbs and can squat over 700. LaTerrion Green hasn’t got a lot of D-I offers yet but our very own Lee Brecheen thinks that D-I offers will be coming his way this year. “Laterrion Green is a very good and underrated DT,” Brecheen said. “He is one of the best defensive tackles in North LA and can really move at 300 lbs. 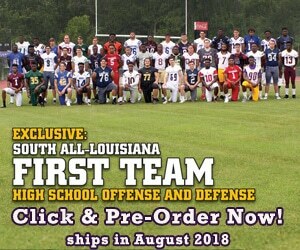 He can play nose guard technique and has the ability to play that position in the D-I level.” LaTerrion Green has already proved to be one of the best defensive tackles in North LA and is still getting better which is not good news for any offenses that are preparing for Winnfield in the fall. Read more about LaTerrion Green as he talks about the season, his favorite player, and his goals for the season! LAFM: What is your ACT and GPA score? LAFM: What is your 40 yard time, max bench press, max squat, and vertical? LAFM: What were your stats and accomplishments from last year? LAFM: Did you receive any offers from college? If so, who are they? I haven’t received any offers yet. LAFM: How has the recruiting process been treating you? The process has been really good overall. LAFM: Is there any advice that you would like to give to a teammate about the process? My advice is to take one day at a time. LAFM: Do you play any other positions besides nose guard or defensive tackle? I also play offensive tackle for the team. LAFM: Last year, the team went 7-5 and won a playoff game. What is the next step for the team this year? The next step is for us to win the state championship. LAFM: What are your strengths at the position? My biggest strength is hand placement. LAFM: What are elements to you game that you need to work on? I need to work on many aspects in order to get better. LAFM: Since you are a defensive lineman, what is your favorite food? Chicken Spaghetti is my favorite food to eat. LAFM: What are your individual goals for the season? My goals are to be an individual leader for the team and to win the state championship. LAFM: What college or NFL player do you compare your game to? I’ve always liked Marcell Dareus (former Alabama DT, current DT for Buffalo Bills). No sir. There is nobody in my family that has played football. LAFM: Who are some people in your life that helped you be in the position that you are at today? My grandmother and my mother are people that really helped me in my life. LAFM: If an Alabama or a LSU asked you, what separates yourself from any other defensive tackle in the state, what would you tell them? I would tell them that I’m stronger, faster, and more hard working than anyone else.